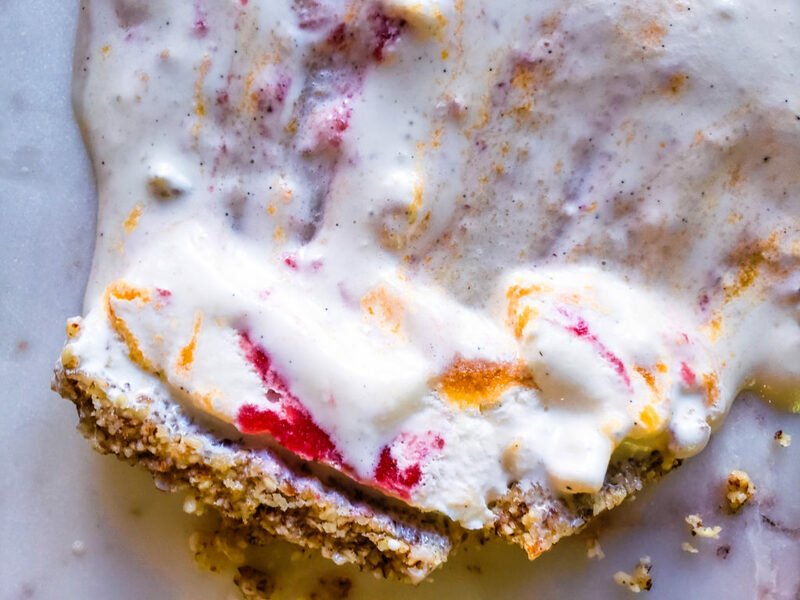 Strawberries and peaches are pureed until smooth then swirled through vanilla ice cream and layered atop a crunchy, nutty base to create a dessert that looks like a summer sunset. 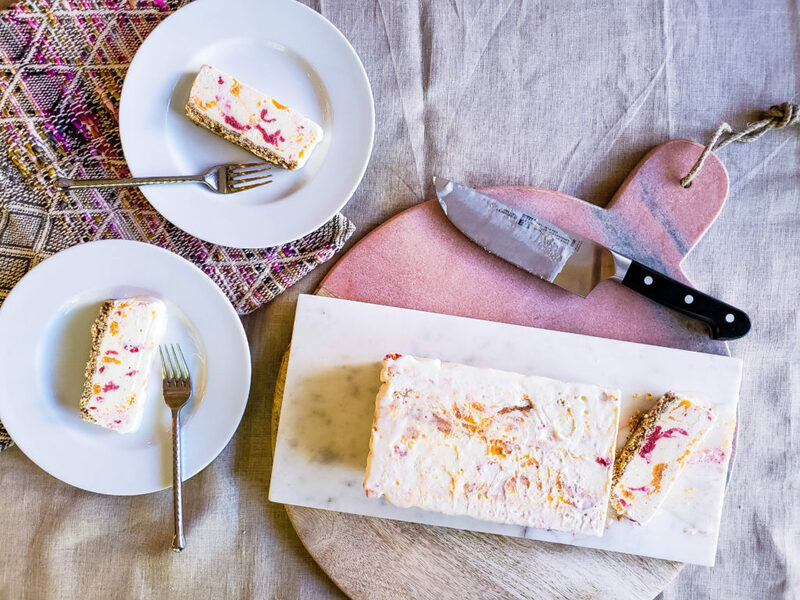 This dessert plays equally well during a backyard cookout as it does an end-of-summer dinner party, especially when served alongside a glass of white port. Confession time. I am not a dessert person. I don’t love sweets. Given the choice between dessert and a second helping of a savory side dish or a cheese plate, I will, 99% of the time, go for the savory side or the cheese. Or, quite frankly, a second (ok, maybe third) glass of wine. Or a glass of port which, yes I know is sweet, but somehow, different. But Trey, he’s a man who loves dessert, plus when we have guests over for dinner I feel like I haven’t done my hostess duties if I don’t provide a dessert. After all, I may be the only one at the dinner table who would rather revisit the appetizers than have a proper sweet ending to the meal. Every once in a while though, I see something that sways me, just a little, towards the sweet side. 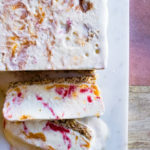 Recently it was the Peach Melba Popsicles Deb at Smitten Kitchen posted on Instagram. I admit I am a sucker for beautiful food and these are gorgeous! They were also the perfect solution for the pile of fresh fruit I had just waiting to go bad before I could use it all up. Deb used peaches and raspberries with a bit of simple syrup in her popcicles but since I had peaches and strawberries I used those and because they’re both plenty sweet I didn’t need to bother with the simple syrup. I also wanted to make this into a dessert I could serve at a dinner party. 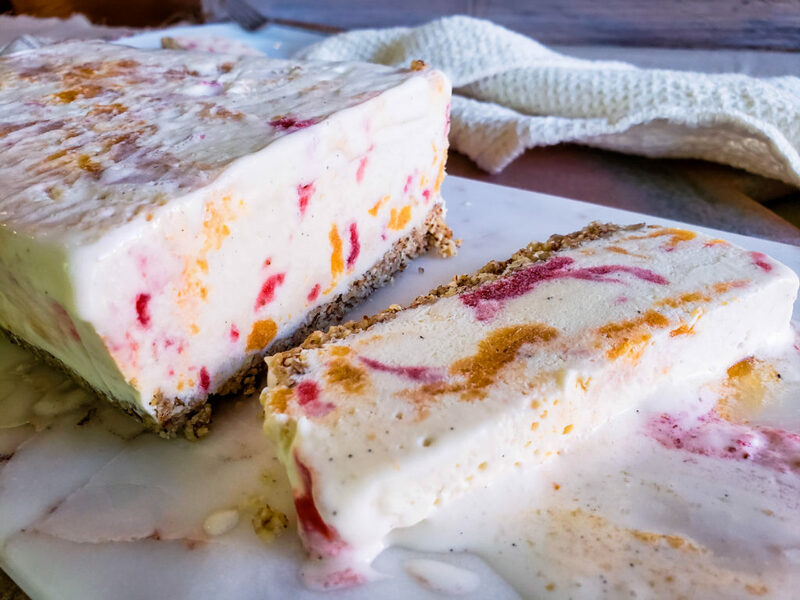 And while, of course, it would be perfectly acceptable to serve popsicles at a dinner party, I couldn’t get the image out of my head of beautifully marbled slabs of this creamy dessert melting slowly into Tahitian sunset-like clouds, so I decided to make it into an ice cream cake. Besides the fact that after several years of letting our popsicle molds gather dust in the back of a cabinet, I recently threw them out and wasn’t about to go buy more. I used almonds to create a thin, graham cracker-like crust on the bottom of this cake but I’ve also thought about making it again with different nuts, particularly macadamia which would go hand in hand with the whole tropical sunset vibe I’m getting from this dessert. Truth be told, I’ve been holding on to this post for weeks because I wanted to try a more healthful version with yogurt in place of the ice cream. I studied various ways to make frozen yogurt but they all included the addition of heavy cream and sugar – which sort or defeats the point of a healthful version, don’t you think? I believe I’ve figured out a compromise but haven’t had time to perfect and photograph it, and seeing as how social media and all the retail stores have given up on summer and are pushing all things pumpkin and spice, I decided I couldn’t wait any longer to get this out to you. Whenever I’m able to perfect the healthful version I’ll update this post. Because, as mentioned above, I love a final glass of something to finish off a good meal, we tried a few pairings with this dessert. 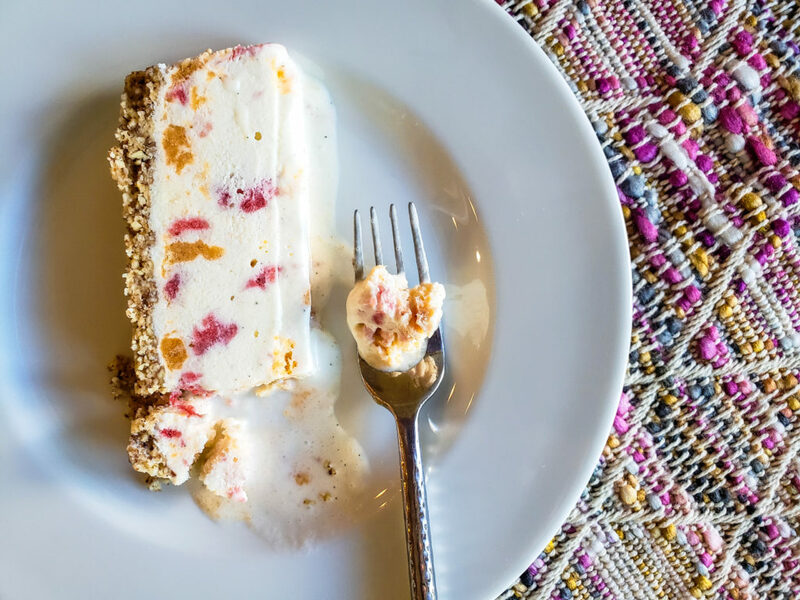 While pairing wine with ice cream is a bit tricky, it can be done. After trying several options… sherry, bourbon, tawny port and white port, both Trey and I agreed the white port was the best match. You could also try pairing it with a Moscato, Sauternes or an ice wine. 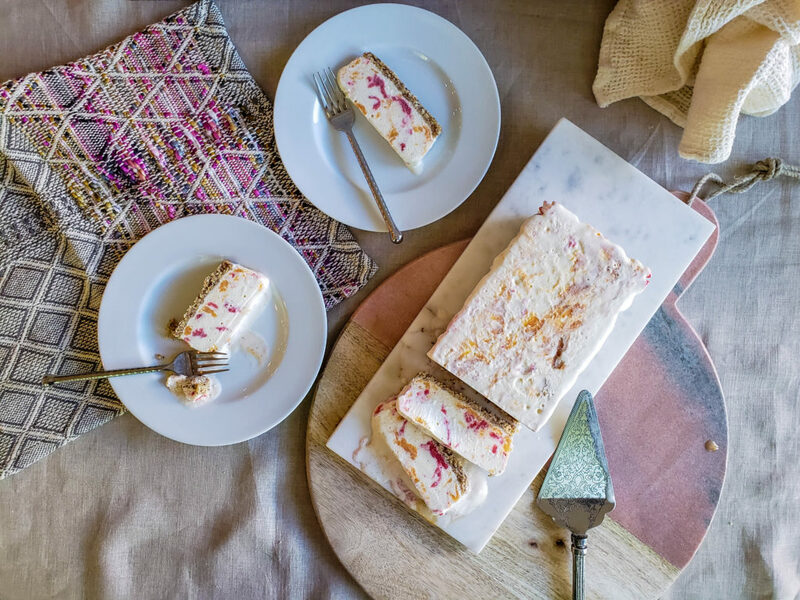 One of the best things about this dessert is you can slice off a large or small slab anytime you want a sweet end to your meal. Just keep the remaining cake wrapped tightly in airtight packaging and it will keep quite a while in the freezer. Take it out of the freezer about 10 minutes before you’re ready for it and use a sharp knife to slice off a serving. 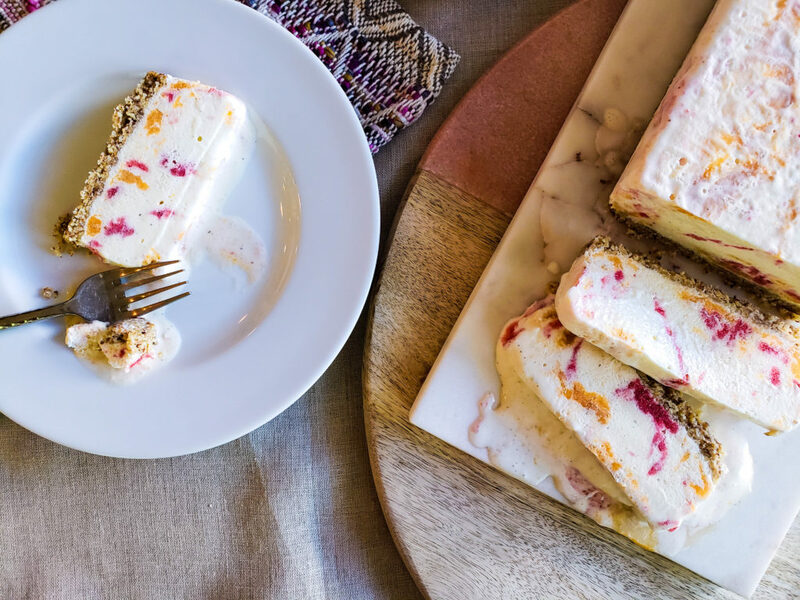 Strawberry and peach purees are swirled into vanilla ice cream and layered atop a crunchy, nutty base to create a dessert that looks like a summer sunset. 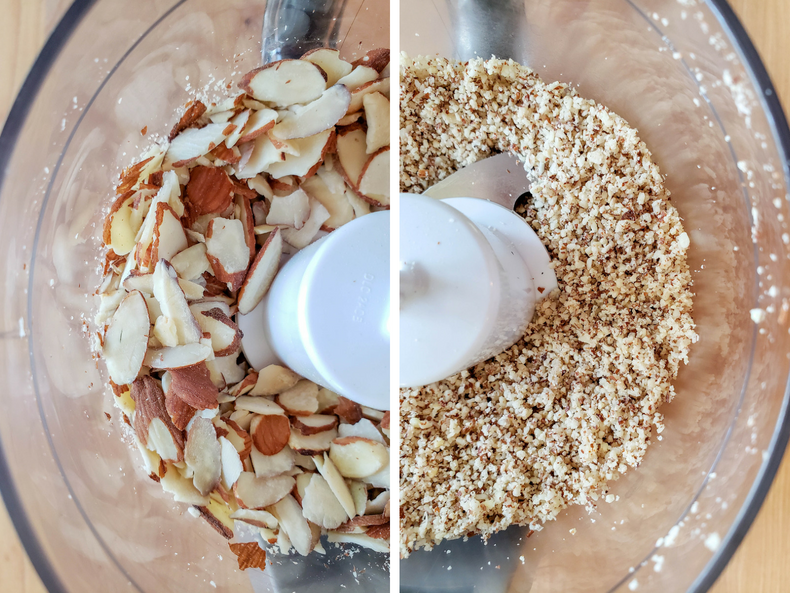 Add the almonds, butter, 1/2 teaspoon vanilla extract and salt to a food processor and pulse until it forms a semi-course meal. Pinch a clump with your fingers to make sure it holds together, if it doesn't add a bit more butter until it does. Line a loaf pan with wax paper then add the almond mixture to the pan. Spread the almond meal into the bottom of the pan, pressing with your fingers to make sure it is in an even layer along the bottom of the pan. Set aside. While you are pureeing the fruit in the next step, let the ice cream sit on the counter until it is the consistancy of soft-serve. Puree the peaches in a blender or food processor until smooth then pour into a small bowl. Repeat with the strawberries. 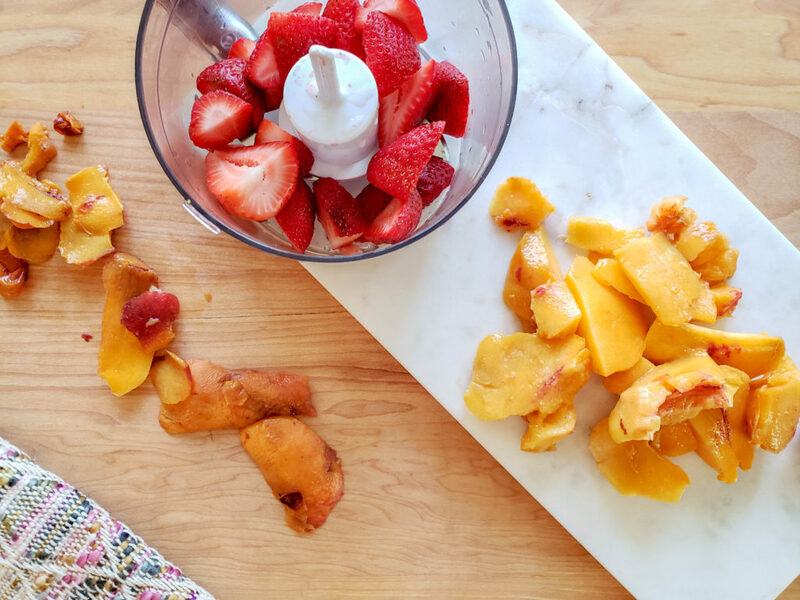 If you do the peaches first you shouldn't have to clean the blender between fruits to avoid mixing the colors. *If either fruit puree is too thick add a 1/4 teaspoon vanilla extract. Once the ice cream is a spreadable consistency, scoop 1/3 of it into the loaf pan and smooth flat. Drizzle half of the peach puree over the ice cream and use a chopstick or a knife to swirl the puree into the ice cream a bit. Add another 1/3 of the ice cream and repeat the process using all of the strawberry puree. Add the remaining ice cream and top with the remaining preach puree, swirling it through the ice cream as well. 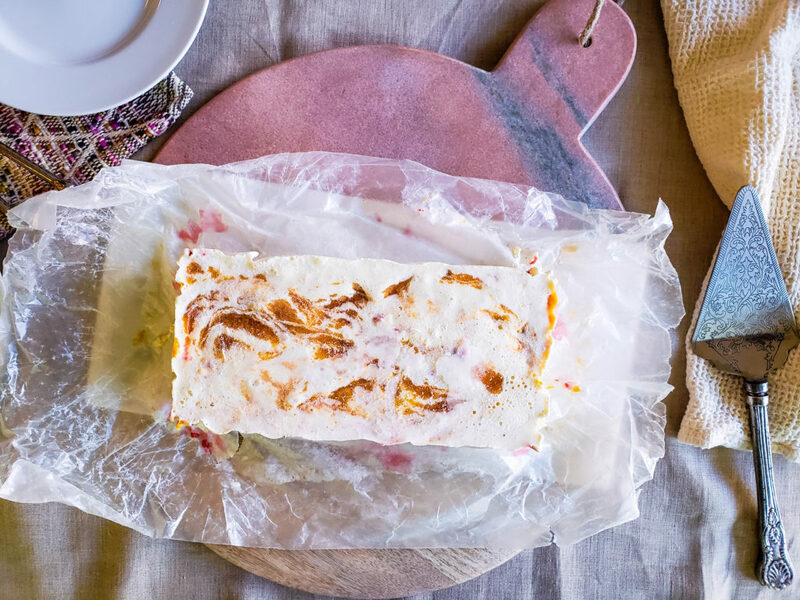 Cover the ice cream cake with another piece of wax paper and place it in the freezer for at least 2 hours. 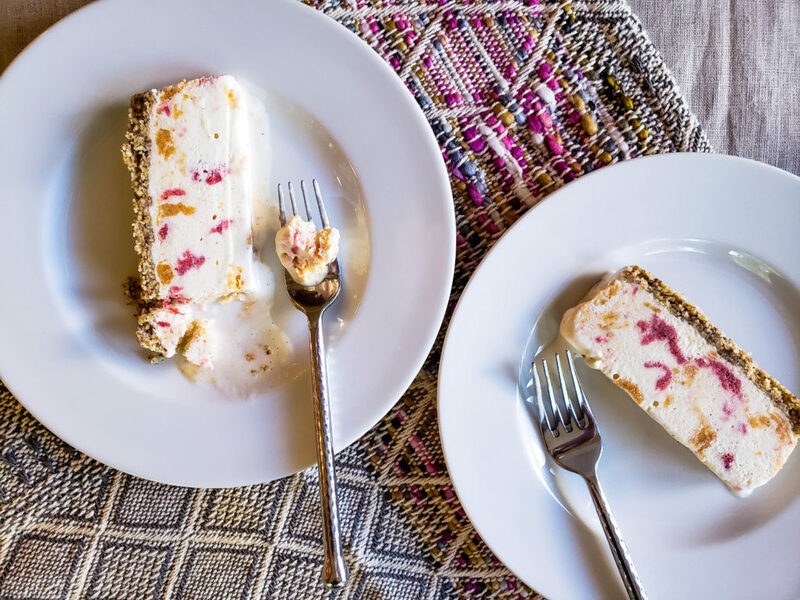 Take the ice cream cake out of the freezer and grabbing ahold of the edges of the wax paper, remove the cake from the pan. Let the cake sit on the counter for about 10 minutes to soften before serving. Using a sharp knife slice off slabs of the cake. To make this vegan just swap the ice cream out with a non-dairy option and replace the butter with coconut oil. Sounds great! 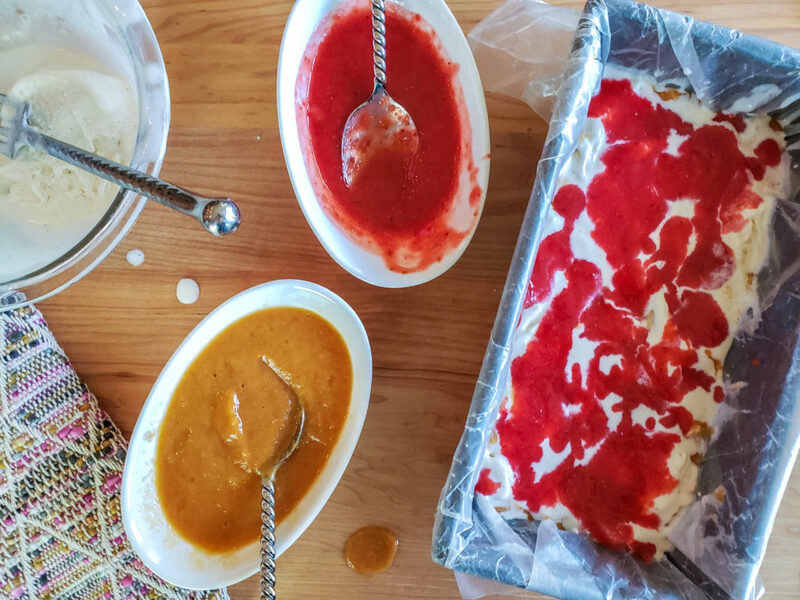 Strawberry or peach homemade ice cream are among my favorite for late summer. Wow! What a strikingly pretty desert! And the taste must be fabulous!